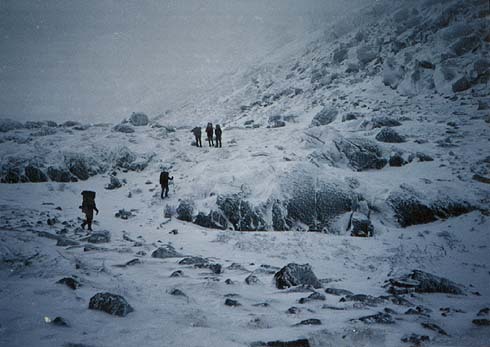 This page is a collection of information about winter hiking. It is not a "How To" guide. 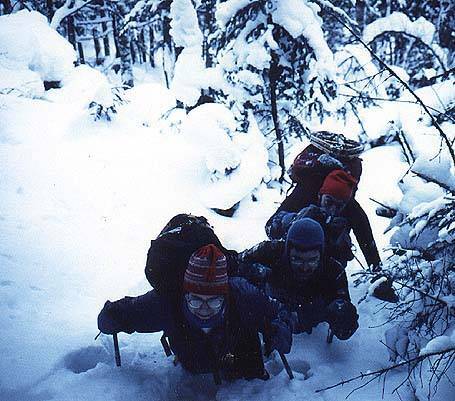 Winter hiking in the White Mountains is a strenuous and serious undertaking. It can also be an infinitely rewarding one. In there winter, you must keep in mind that your margin of error is much smaller. Things that are little nagging problems in summer can become major hassles, even life-threatening ones when the temps drop. So, you will be carrying more weight on your back and planning less ambitious days. Conditions will dictate the distance you travel. On skis, in good weather over gentle terrain you can cover 15 miles in a day. 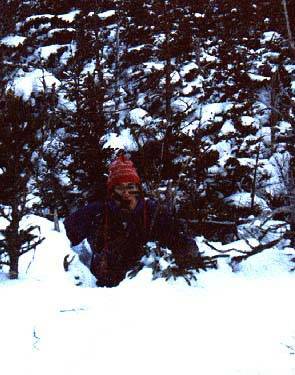 Snowshoeing through deep snow, steep terrain, and spruce traps you might be lucky to make two miles. For this reason, it's important not to make plans that require you to get to a certain point at a certain time. Carry your shelter with you, don't rely on making it to a shelter or cabin. Water is always important in the woods, more so in winter. You will be expending much more energy and the dry air will dehydrate you much quicker. Drink water, LOTS of water. Figure on 4 liters per person per day as a minimum, though most people will drink much more than that. Every time you stop and rest, drink water. You will be burning up a tremendous amount of energy, so you need to continually replenish your supply. You can eat lots and lots of food during a winter hike because your body is working extra hard plus trying to keep warm. It's not uncommon to eat 4000- 5000 calories per day. Eat often in the winter. Don't let yourself go for long periods of time without food. That can lead to hypothermia, when your body runs out of fuel to burn. I have used many different boots in the winter, none of them are perfect for all situations. If you are only dayhiking, you can get by just fine with heavy leather hiking boots. Wear two pair of wool socks with plenty of room to wiggle your toes and you can be comfortable on a normal day hike. Most leather boots will accept a flexible crampon, but they may not be appropriate if you plan on hiking for long distances above treeline. If it's real cold or you are planning to go out overnight, leather boots become inadequate. They soak up water during the day and freeze up overnight, making it difficult or impossible to put them on in the morning. Another choice that many people in New England use is pak boots, like Sorels or LL Bean Winter boots. They will keep your feet nice and warm, but are a little more difficult to hike in. If you are going out overnight, you can wear the insulated liners to bed and have warm boots in the morning. You can bring two pairs of liners to make sure you always have dry warm feet. The big drawback of these boots is that they don't accept crampons very well. 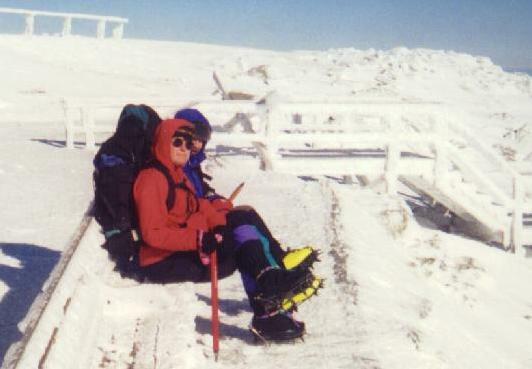 The boots are too flexible to securely attach crampons, although they will work for short periods of time. For serious mountaineering or overnights, plastic double boots are the way to go. These boots cost a lot of money, so I wouldn't go right out and buy a pair before your first winter hike. You can rent them from IME or EMS in North Conway and maybe in other places as well. Make sure not to get ice climbing boots, as these are too rigid for easy walking. They will turn your feet into hamburger very quickly. Some plastic boot aren't designed for extreme cold weather, so shop carefully. One big advantage is that they will accept step-in crampons, kind of like a ski binding attachment system that allows you to put on crampons without fumbling with frozen leather straps while your hands freeze solid. Layering is a must for winter hiking. Start with a layer of wicking underware, tops and bottoms. There are all sorts of brand names, but any sort of polypropylene will do. This layer is here to wick the mosture away from your skin, where it will cool you off. The next layer or several layers will be for insulation. In the old days, wool was the only fabric of choice, but now there are several synthetic fabrics (Polarfleece, pile) and down. For active wear (while hiking) fleece or wool works better than down, since down looses it's warmth when it gets wet. While hiking, a thin fleece layer works best for me. Once in camp you will need several more layers of fleece, down, or wool. The final layer, outerware, must be impervious to wind and snow. Most folks use a waterproof/breathable fabric, like Gore-Tex or similar fabrics from other manufactures. It's important to look at the garment and not just the fabric. There are lousy jackets made out of good materials. An integrated hood is a must. Additional pieces of clothing you will need include a pile or wool hat, mittens and overmitts (no gloves, mitts are much warmer), neck gaitor or face mask, wool socks, and gaitors. Finally, NO COTTON! The standard quip is "Cotton kills." Cotton doesn't keep you warm once it gets wet and becomes useless overnight when it freezes solid.